Sweet and tart cherries go together beautiful with the crunch of freshly toasted almond in this "couldn't be easier" breakfast braid! The slightly almond flavored glaze makes this danish feel more like dessert than breakfast! Cherry pie filling and refrigerated crescent roll dough make this recipe extremely easy to pull together. However, if you are looking for a more made from scratch type recipe, you can easily make your own cherry filling, if you have access to tart cherries. I love using the frozen tart cherries from our local farm, but they can't be found everywhere. Make homemade cherry pie filling by adding 1/2 cup of sugar with 2 tablespoons of corn starch and the tart cherries. Heat for about 5 minutes, let cool, and spread like you would the regular cherry pie filling. You can also replace the crescent roll dough with puff pastry. It takes a little longer, because the puff pastry has to thaw before you use it. The puff pastry puffs up beautifully and has a more delicate flavor than the crescent roll dough. Serve up this braid on your holiday breakfast or brunch table. It will feed quite a few and looks impressively beautiful when served whole or sliced! Roll out the crescent roll dough into a thinner, rectangular sheet. Toast the almonds in a dry saucepan for about 30 seconds. Place the cherry pie filling over the center of the crescent roll sheet, leaving about an inch and a half of dough on either side of the filling. Sprinkle the toasted almonds over the cherry pie filling. Make diagonal cuts into the dough, starting where there isn't cherry filling and stopping when you get to the cherry center. Make about 10 cuts on each side. Pull the strips of dough over the top the cherries and almonds, alternating sides. Sprinkle the top of the braid with the coarse, turbinado sugar. Place on the center rack of the oven and bake for about 15 minutes, or until golden brown. While it is cooling, whisk together the whole milk, lemon zest, almond extract, and powdered sugar. If the glaze is too thin, add more powdered sugar, if it is too thick to drizzle add a tiny bit more milk! 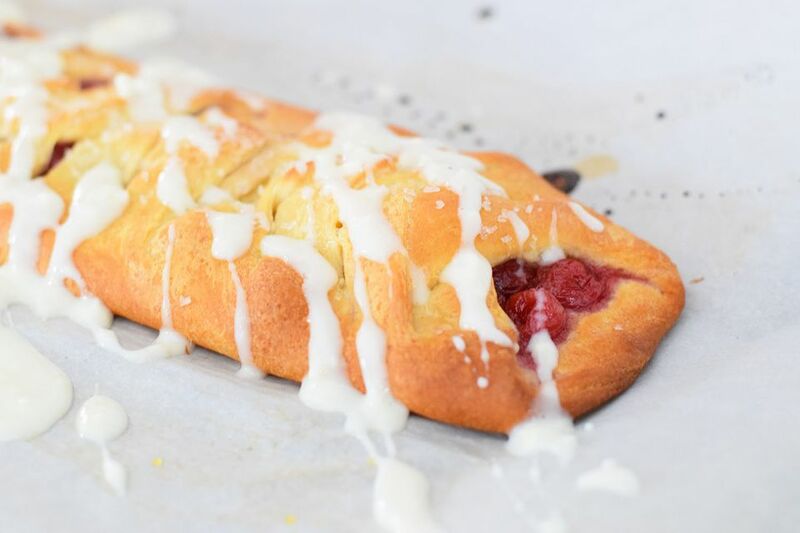 When the cherry braid has slightly cooled, drizzle the glaze over the top and serve!